Syria and Britain have been holding high-level intelligence talks in order to combat terrorism, Syrian officials have told the BBC. The officials said preparatory meetings had been going on for several months in secret before the news was leaked by the UK's Times newspaper on Wednesday. They added new levels of co-operation had been reached during the UK foreign secretary's visit to Syria this week. 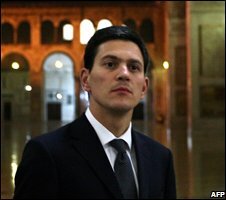 David Miliband said Syria could play a constructive role fostering stability. "We hope that the co-operation with Britain will bring much better results in the fight against terrorism," a senior Syrian source told the BBC. Syrian Foreign Minister Walid Muallim reportedly invited Mr Miliband to bring intelligence officials with his delegation to Damascus, which was the first visit by a UK foreign secretary since late 2001. Mr Miliband's meetings, and reciprocal presidential trips between Syria and France, have brought to an end a period when Damascus was shunned for hosting exiled leaders of the Palestinian militant movement Hamas and providing support for the Lebanese movement Hezbollah. Syrian intelligence officials were also implicated in the assassination of former Lebanese PM Rafik Hariri, although Syria has strongly denied involvement. The US has repeatedly accused Syria of not doing enough to stop insurgents from crossing the border into Iraq and recently launched a deadly raid inside Syria which US sources said targeted a top al-Qaeda in Iraq figure. Meanwhile, Syria itself was hit by a deadly car bombing, killing 17 people in late September, which Damascus blamed on Islamist militants who infiltrated "from a neighbouring Arab country", thought to mean Lebanon. UK officials have not confirmed the intelligence contacts with Syria. In a BBC interview, Mr Miliband expressed caution, saying the country could be a "force for stability or it can be a force for instability".